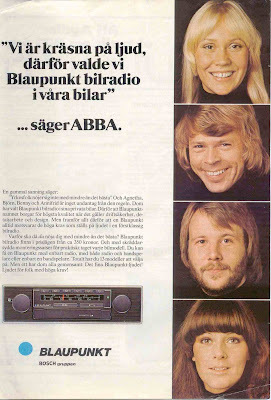 ABBA advertising Blaupunkt using some stunning pics, Sweden 1975. Ha! My dad is buying a car and I went with him to a car dealer the other day. He decided for one which has a nice Blaupunkt stereo system. The look is the same as the one sponsored by ABBA but theres a cd/mp3 player instead of a cassette player. Hehe, sign of the times..